Spenser quickly learns that the Ukrainian mob is responsible for the hit, but finding a way into their tightly knit circle is not nearly so simple. Their total control of the town of Marshport, from the bodegas to the police force to the mayor's office, isn't just a sign of rampant corruption--it's a form of arrogance that only serves to ignite Hawk's desire to get even. As the body count rises, Spenser is forced to employ some questionable techniques and even more questionable hired guns while redefining his friendship with Hawk in the name of vengeance. I have been a fan of Robert Parker for years and this was really the first book of his where I jumped to the end to get it over. Parker does his best work when the stories are about individuals and not the grand concept of "crime." At no point did I ever care how this ended, I just wanted it to end. Stay away from the organized crime and go back to protecting the individual. I finished one CD and part of another before I gave up. The narrator, Joe Mantegna, was boring and showed little or no emotion in his voice. His vocal characterization of a black man's voice annoying to say the least. And although its not the readers fault, the constant "I said," "he said" at the end of each sentence was very distracting. I would barely give this book a "one" and I definitely would recommend it to anyone. 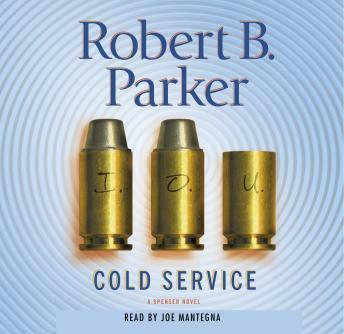 Among Parker's books, "Cold Service" starts a bit too procedural at times, as it spends too much time just serviceably moving the plot forward without adding all the personal insights, witty cultural comments and sharp interplay between the regular characters. Partly because sidekick Hawk takes a bigger role, and his character is based on cool strength and lack of emotion, the story takes a while to catch hold. But it does. For fans of the series, it focuses on this trusted, intuitive relationship between two macho guys, and for that, it's an interesting addition. But it's not the place to begin for a newcomer to the Spenser series. I really tried to like this book. I love Joe Mantegna as an actor, but he needs to stay in the acting arena and leave the book narration to the professionals. His delivery of what should have been hysterically funny lines laid flat on the recording studio floor. classic Parker. Once you get past the "he said"..."she said" It is one of his better books...the spencer/hawk relationship is at its best. And the addition of the other characters...Vinnie,Tony Marcus,Cholo....etc shows the reader how much the "Baddest of the Bad" respect Hawk and Spencer. Started out with too many I said, he saids; but, quickly got me caught up in the story and humor. Thoroughly enjoyed this book. Hated to pull into my driveway at the end of the day...I wanted to listen more! I like most books by this author and this was no exception. Kept me interested throughout and I found myself looking forward to getting back in the car. Love the character and the narration was good as well. Love Spenser and Hawk. Found myself cheering them on while driving. I really didn't like listening to this audio. In fact, I only made it through the first cd. Perhaps an abridged audio would be tolerable, but I found the repeated "I said" "He said" too annoying to listen to.